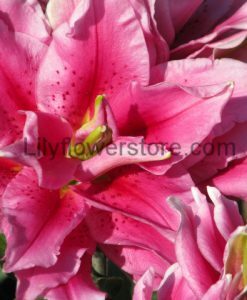 Rose Lilies or Roselilies features double or roselily flowering orientals. Light, pleasant fragrance. And, no pollen on clothing. Or anywhere! Also, no overbearing aroma. Reduced to a lighter, delightful scent. 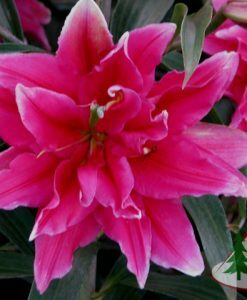 Rose lilies are bred to have at least 18 flower petals. Moreover, 12 more than traditional Orientals. 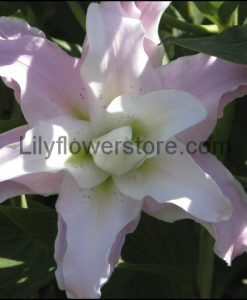 This truly distinguishes the Rose lily series from other Orientals. Best grown in locations with morning full sun, afternoon shade. In addition, they grow 30 to 36 inches tall. Equally suitable for growing in 2-gallon containers or larger. And in raised beds. Or in the landscape and garden. 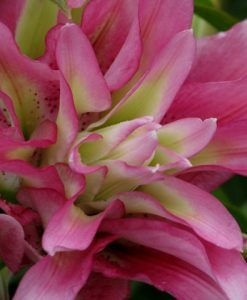 Excellent cut flower for indoors.